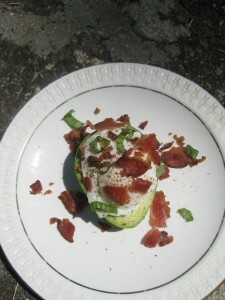 The Missing Ingredient® power breakfast, Poached eggs & bacon in an avocado boat. A grain-free breakfast is a great way to start your day. Replacing your toast with an avocado gives your body a healthy source of fat to help it absorb fat soluble vitamins A,D,E and K from the foods we eat. You will love the way you feel after eating this winning combination. 4) Slice the avocado down the middle from top to bottom in a circular motion. Then twist the avocado to separate. Use the half that doesn’t have the pit still attached. Rap the remaining half leaving the pit attached ( this will keep it from getting black) and store at room temperature until you use it. 5) Crack the egg shell and drop the whole egg slowly into the simmering water. Cook for about 3-5 minutes depending on your stove. 6- Slice a small piece off the bottom of the avocado so it sits evenly on a plate. 7- With a slotted spoon remove the egg from the water, and place it in the center of the avocado. 8- Top with crumbled bacon and torn herbs. Salt and pepper to taste. *** For those of us living with Celiac Disease it is very important to get as many good sources of fats in our diet since our bodies have trouble absorbing fat soluble vitamins A,D,E and K. Incorporating avocado’s, Cold Pressed Extra Virgin Olive Oil and Organic Raw Coconut oil into our diets helps ensure that our bodies have the tools to absorb these very important vitamins. This entry was posted in Recipes and tagged Frank Baldassare the missing ingredient, Gluten free grain free recipes The missing Ingredient, gluten-free, grain free soy free recipes, The Missing Ingredient, The Missing Ingredient gluten free TV Show, The Missing Ingredient Paleo breakfast.. Bookmark the permalink. ← The Missing Ingredient® Gluten-free recipes Turkey Chili.